I’ve always loved the idea of panzanella salad, mostly because it combines two of my favorite things: salad and bread. I tend to think of panzanella as being a summer dish, bursting with juicy tomatoes and basil. But, as this roasted root vegetable panzanella with creamy shallot dressing demonstrates, greens and bread go really nicely with all sorts of seasonal produce. This is the ultimate winter panzanella, a hearty mixture of sweet/savory root veggies, spicy greens, a creamy roasted shallot vinaigrette, and those characteristic bites of bread. Like many people, I change my salad routine in the winter months. 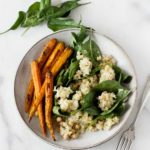 My favorite dressings and flavor combinations are often the same, but I’m more likely to build a salad around grains and roots than I would be in the summer, when I often put produce at front and center. 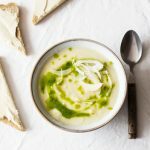 I didn’t used to eat with the seasons as closely as I do now, but one meaningful part of moving away from any attachment to a raw food philosophy has been embracing more seasonal rhythms and seasonal recipes. This salad is such a great example of wintertime fare that comforting and hearty, yet still fresh. I recommend using a spicy green for the salad if you can: mizuna, beet greens, and arugula are great, but for something milder, mache would also be nice, too. I chose my favorite root vegetables for this dish: parsnips, rutabaga (which I love), carrots, and golden beets. You can swap any one of these with sweet potato, turnip, celery root, or sunchokes. Mix it up, incorporate color, and be creative! One fun feature of the salad is that you roast the shallots that are ultimately blended up into the vinaigrette along with all of the roots. Once your vegetables are ready, simply pull the shallots off of the roasting pan and blend them with olive oil, vinegar, Dijon mustard, salt, and pepper–it’s a simple but really tasty combination. If you don’t have shallots at home, you could roast a whole head of garlic while the vegetables are in the oven, too, and make a roasted garlic dressing instead. Preheat the oven to 375. Place the carrots, parsnips, rutabaga, beets, and shallots in a large mixing bowl. Toss with one tablespoon of the olive oil, the maple syrup, the coarse salt, and a generous pinch of freshly ground black pepper. Place the vegetables on one or two parchment or foil-lined baking sheets. Roast for 30-40 minutes, stirring a few times during roasting to prevent burning or sticking, until the vegetables are golden and tender. After roasting, separate the shallots from the rest of the vegetables. Place the shallots in a blender with the remaining 3 tablespoons of olive oil, the vinegar, the mustard, the sea salt, and another pinch of black pepper. Blend till smooth (a few specks of visible shallot is fine!). Place the roasted vegetables, greens, and bread into a serving bowl. Toss with the shallot dressing. Serve. Leftover salad will keep overnight in an airtight container in the fridge. 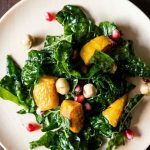 It’s worth saying that the creamy roasted shallot dressing will be great on all sorts of other salads, too; I’d love to try it on my festive kale salad with cranberries, lentils, and coconut bacon, my red quinoa salad with hazelnuts, fennel, and baked tofu, or my roasted carrot and avocado salad. I recently heard a fellow food lover call this the “sad” time of year for cooking. Of course I knew what she meant: not as much variety of produce as we have in summer or fall. But the truth is that I really love winter from a culinary standpoint: the embrace of comfort food, the ingenuity of pantry cooking, and the abundance of root veggies. This salad is a perfect way to celebrate winter’s bounty–and as far as salads go, it’s a really satisfying one to eat. On that note, I wish you all a fantastic Thursday. It’s been a long time since I shared a Green Recovery story, so I’m happy to say that a particularly thoughtful one of those is on the agenda for tomorrow. See you soon! I am a huge bread fan too and this looks like a wonderfully fun way to mix up a salad. Thanks! This salad looks so good! I need to have this for lunch or dinner soon! I love the flavours you’ve used in this – thanks for sharing! Love that you used root veggies in this!